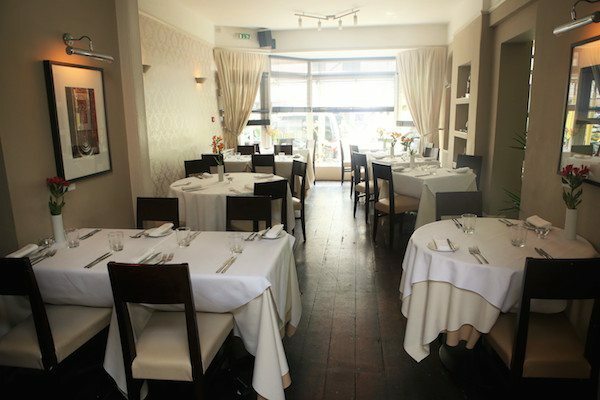 Relaxed Dining in the Heart of Kemptown. The great thing about ‘relaxed dining’ is it’s totally one sided: the diner does quite a bit of relaxing while the restaurant staff do everything they can to make you feel at home. 24 St Georges illustrates this point perfectly. 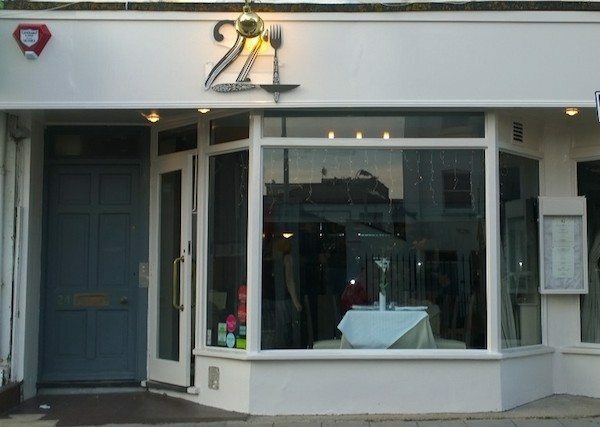 A little off the beaten track, in the heart of Kemptown village, the setting is definitely more relaxed that the bustle of central Brighton – yet it’s only 10-15 minute walk from the Royal Pavilion and worth going the extra half mile. 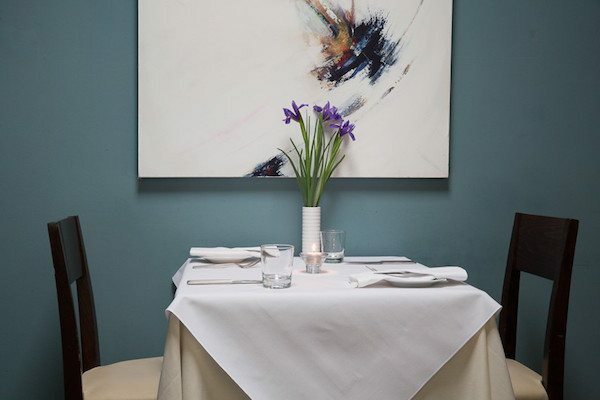 Comfortably stylish, with dark wood floors, high backed leather chairs, creamy woodwork and muted beige flocked wallpaper, 24 St Georges is a neighborhood restaurant,which also attracts a lot of tourists and foodies who’ve heard about its Michelin listing and trans-European menu. There fifty or so covers at tables benath the bar and in a larger adjoining room, plus a back room for private parties and a small al fresco area when the weather allows. 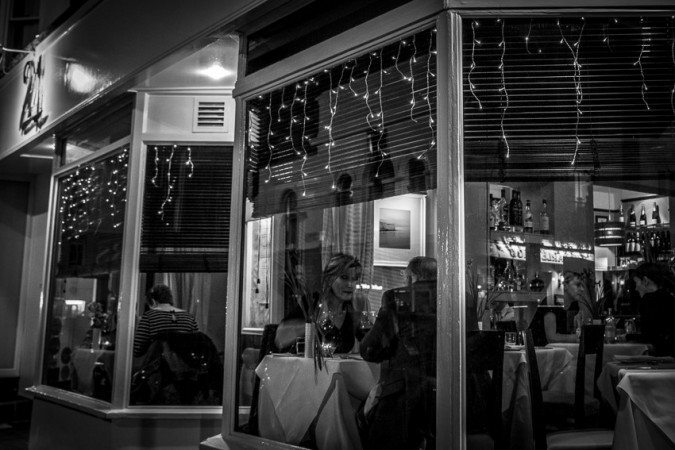 We choose seats right in the window, a place so perfect for people watching that my dining companion is almost superfluous – except his presence allows me to sample twice the number of dishes I otherwise could! 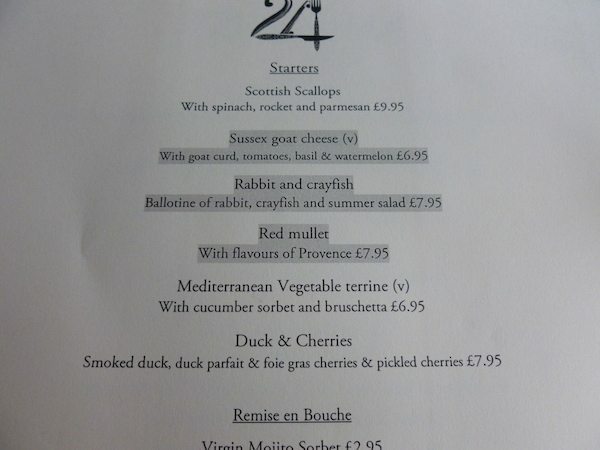 The menu is a clever combination of a la carte and menu de jour, with the daily dishes highlighted so there’s no need for two separate menus. 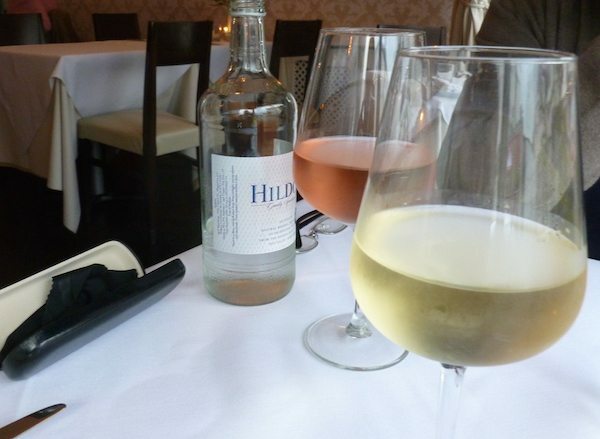 For starters we order Mediterranean Vegetable Terrine and Red Mullet, with a French Mauzac Sauvignon Blanc and a summery rosé Rioja. 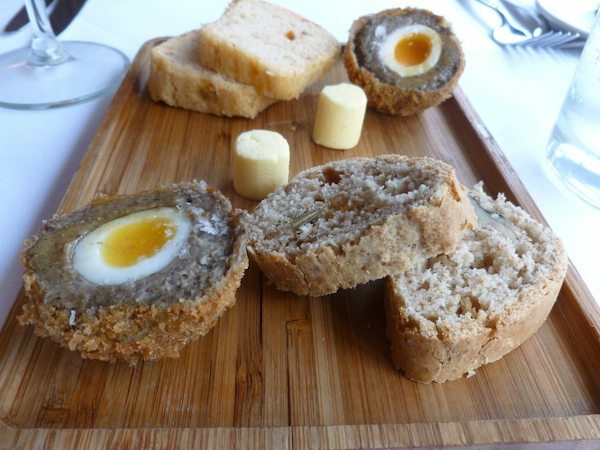 No sooner are we done, than the wine and platter of homemade herby walnut and sun dried tomato breads are slipped onto the table between us, served on a wooden board alongside a sublime rendition of a scotch egg. Banish all ideas of cellophane wrapped service station fare and instead imagine a softly boil Scottish quails eggs with a moist mushroom surround. My vegetable terrine is an ensemble of yellow and green courgettes, red pepper and tomatoes which looks as if they have been woven together rather than pureed and layered, producing a rather beautiful basket effect. It looks as if you could put something in it and carry it away. But for now it’s the perfect receptacle for dollops of black olive tapenade and scoop of cucumber sorbet. The latter is interesting, if a little too sweet for my palate at this stage in the meal. My dining companion’s red mullet presents as a small-sculpted cylinder of compact fish, served alongside a terrine which matches mine. The fish looks ripe for forking and I steal a mouthful of the delicate pinky flesh, perfectly complimented by the sun infused flavours of the Mediterranean terrine. 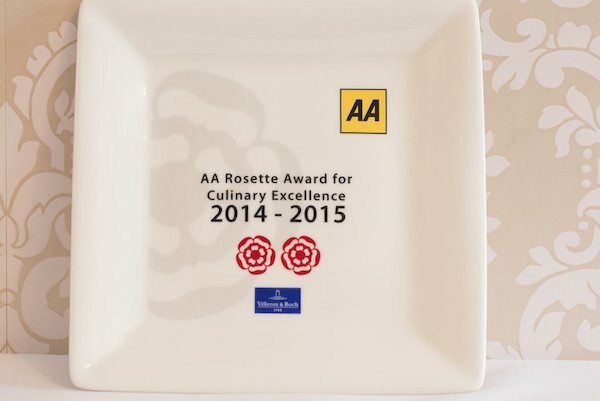 The service here is impeccable: relaxed in style but prompt, efficient and helpful. The staff are unobtrusive as they fill glasses, spread napkins and slip plates on and off the table but equally ready to tell you that the dusting is tomato power and the sweetly suggestive ingredient you can’t quite identify in the lemon sorbet is basil. It’s a palate cleanser with a palatable punch and paves the way for the mains. 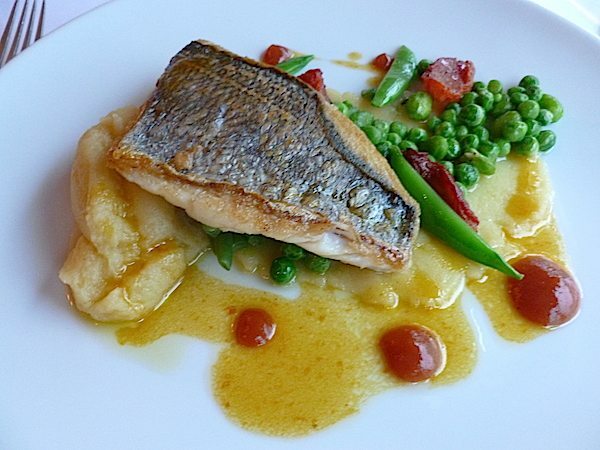 the fish is firm and flavoursome, the pureed potatoes creamy and aromatic with oil and the veg al dente and alluring. My dining companion tells me his lamb is so tender it almost doesn’t taste like meat at all. It’s medium rare but succulent and tender and served with crispy goose fat roasted potatoes, green beans, carrots and a sautéed cabbage leaf so dark and shiny and packed full of flavour it’s hard to believe it’s cabbage at all. DC offers me a taste and I steal one of the accompanying button sized sweetbreads while I’m at it and am rewarded with a deep fried hit or rich lamby offal, the perfect way to offset the succulent slivers or rump. 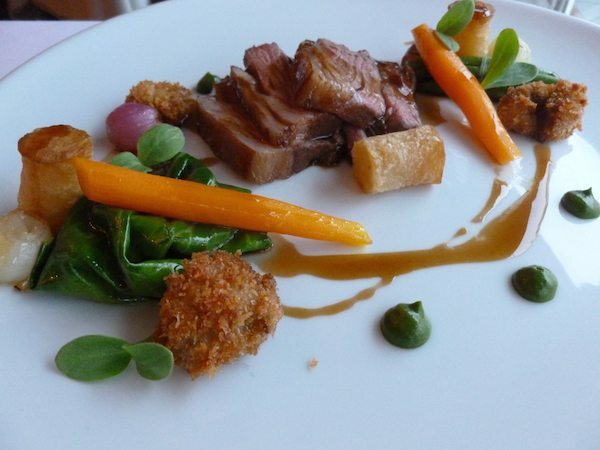 The chefs here use local seasonal produce, where possible, and aim to combine technically accomplished cooking with an ambitious menu to produce food that looks and tastes fantastic. And the dishes we’ve sampled so far certainly hit the mark. At this point my dining companion decides it’s time for a quick stroll. He wants to check out the private function room we can spot through the open French window and the courtyard beyond. It’s dark blue walls and chandeliered lighting set it apart form the rest of the restaurant in style as well as location, creating a space that’s perfect for a larger party of diners. 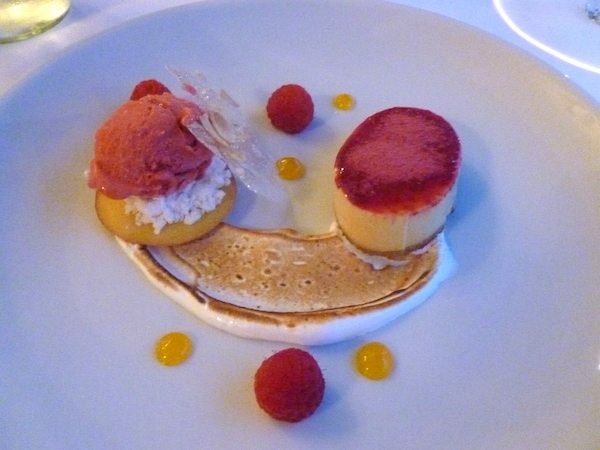 I finish with a peach and almond bavarois (a rich creamy mousse) served with raspberry sorbet, scattered with fizzy raspberry powder, almond caramel and Italian meringue. 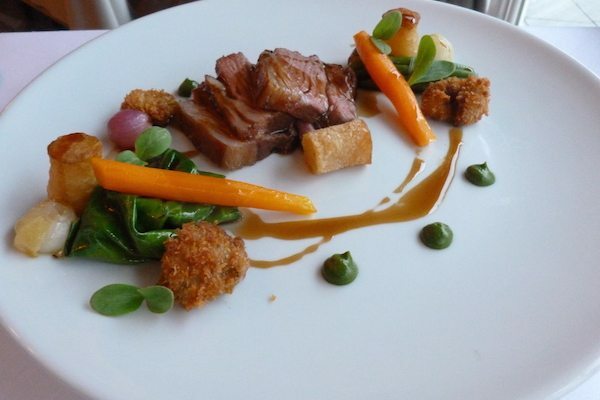 It’s an exciting mix of flavours – none of them vying for more attention than they deserve but each complimenting the other in a way that rounds off a meal which has romped through textures and flavours with a bold inventiveness that defies expectations. DC goes for the summer berries with a wedge of olive oil and berry sponge and a scoop of lemon basil sorbet. Despite its foodie aspirations and the proficiency of the cooking, the prices here are refreshingly good value. 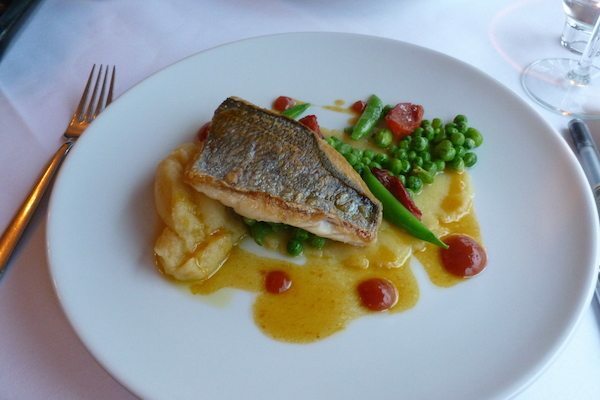 Starters begin at around £7 with mains from £12 and the Menu Du Jour which runs Tuesday, Wednesday, Thursday evenings and Saturday lunch time includes a 2 course meal for £19.95 and a 3 course one for £22.95. So, even when the bill arrives, you can still afford to be fairly relaxed about it.